MORE ELECTRIC VEHICLES have been registered in Ireland so far this year than in the entirety of 2018, new figures show. 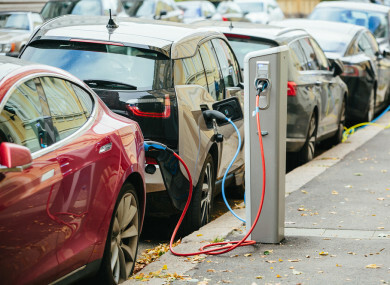 Statistics released by the Society of the Irish Motor Industry (SIMI) show that a total of 1,437 electric vehicles were registered so far this year. Just 1,233 electric vehicles were registered in the whole of 2018. Looking at the overall picture, the total new car registrations for March 2019 are down 5.6% (16,738) when compared with March 2018 (17,726). The new commercial vehicle sector shows a similar picture, with new light commercial vehicle (LCV) registrations down 2.2% (3,067) on March 2018 (3,137). New heavy commercial vehicles (HGV) saw a slight decline of 1.5% (267) in comparison to March 2018 (271). Imported used cars, on the other hand, have increased by 9.98% (8,970) on March 2018 (8,156). “While new car sales are being dampened by Brexit uncertainty, the increase in VRT [vehicle registration tax] on new cars for 2019, arising from the fact that no allowance was made for the first step in the move to the new WLTP emissions testing regime, has also had a negative impact,” SIMI director general designate Brian Cooke said. The EU last week announced that a provisional agreement has been reached with member states that will see road safety technologies become mandatory on vehicles sold in European from 2022 onwards. The new measures will see cars, for example, required to have features such as intelligent speed assistance, lane keeping technology and advanced emergency braking. Last year, 148 people were killed on Irish roads, according to the RSA. The European Commission said it hopes these measures will help save over 25,000 lives and prevent at least 140,000 serious injuries by 2038. Email “More electric vehicles sold in Ireland so far this year than in whole of 2018”. Feedback on “More electric vehicles sold in Ireland so far this year than in whole of 2018”.